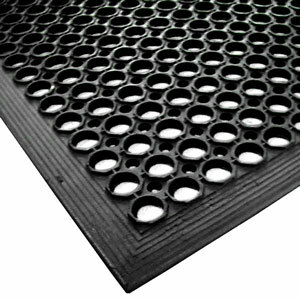 Ensure your bar or kitchen is a safe place to work with this heavy duty Rubber Matting Roll. Ideal for the floor area behind busy bars or in the kitchen, this matt features bevelled edges to prevent tripping, while the holes allow for liquid drainage, helping prevent slips. This durable matting is easy to clean and maintain and can withstand use in busy commercial environments. Not only safe for workers, this matt will help reduce glassware breakages.